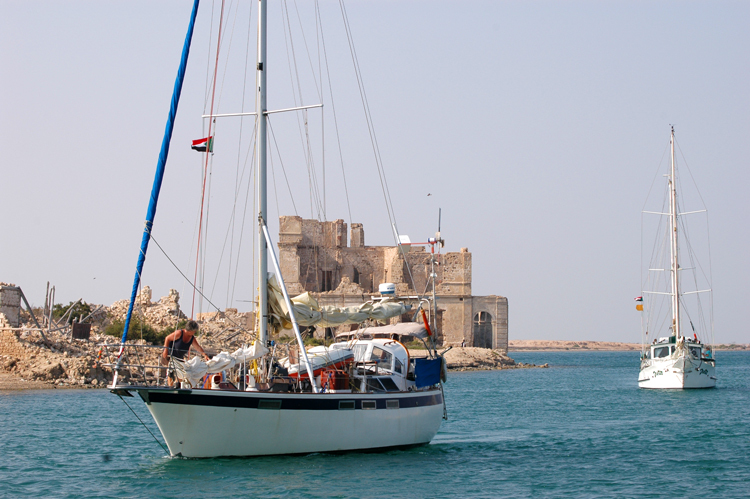 When cruising sailors visit Sudan, they all stop at Suakin. This modest port is a much better stopover than Port Sudan which is the main commercial port in the country. 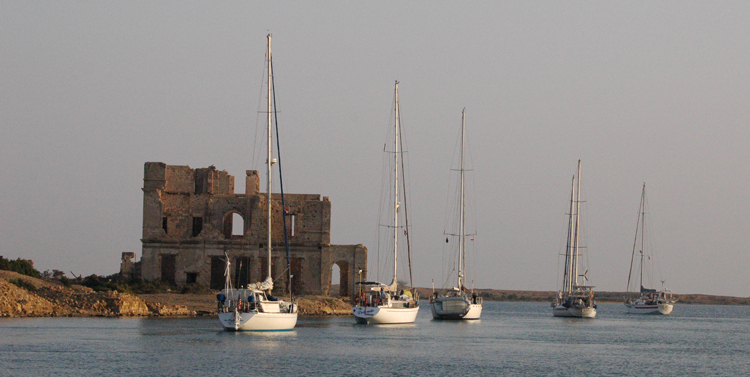 Suakin has a large well protected harbor with good holding in relatively shallow water. You could sit out a real blow in this harbor without much risk of dragging anchor. The ruins of old Suakin occupy a small peninsula north of the anchorage. 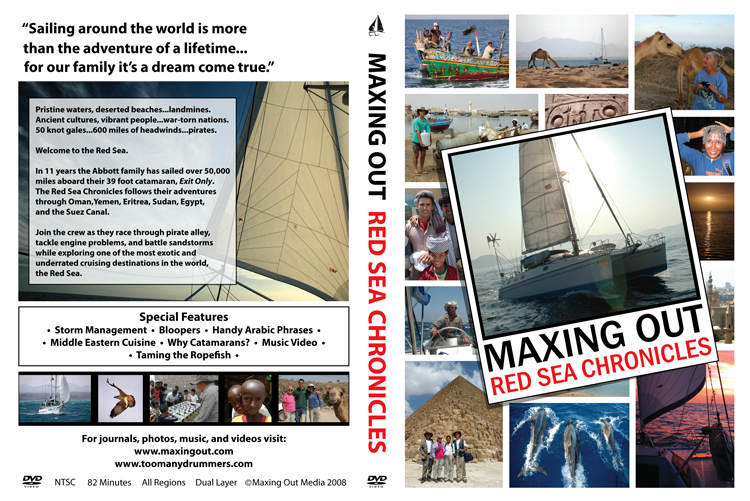 This town was reputed to be the last place in the Red Sea where there was an active slave market. On a more positive note, the town is unique because its white buildings were constructed out of coral. 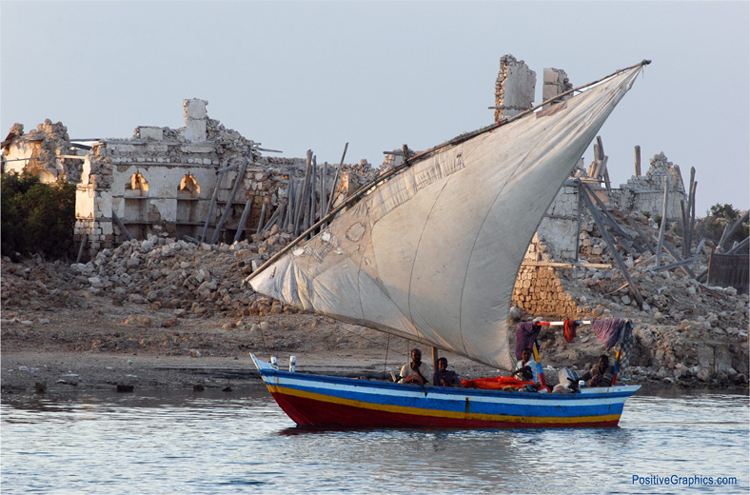 The fisherman of Suakin sail in traditional wooden craft with and without engines. Fishing vessels have a centrally located icebox that they fill with block ice before heading out to sea. Then they ply the waters of Sudan for a week before they return with their catch. 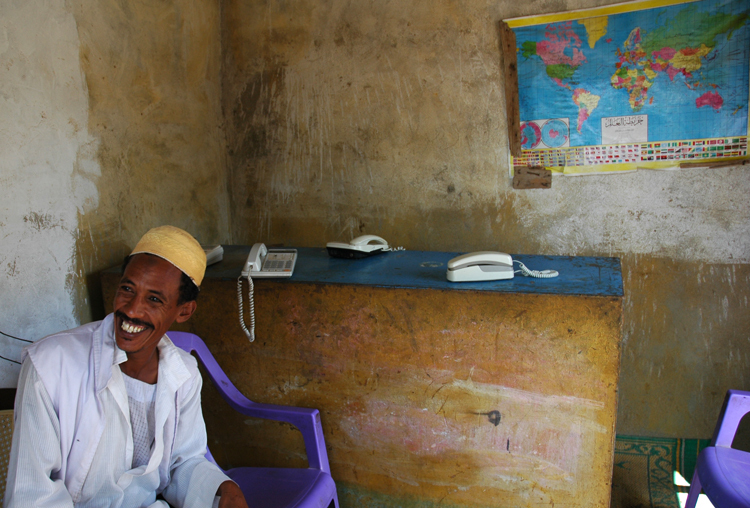 Suakin is an easy port of entry because a self-appointed agent named Mohammad handles all of your paperwork. You give him your documents and some cash, and he completes the formalities of entering and leaving the country. He also arranges for delivery of potable water and assists in transporting groceries to your boat. He is a man of many talents, and a gentleman at that. While anchored in Suakin, we took the local bus to Port Sudan which is thirty miles to the north. Port Sudan had a middle eastern flavor with small shops selling the necessities of life. It was tempting to shoot photos, but we were warned that open photography could result in confiscation of our camera or even a trip to jail. The Dress Code for shopping in Suakin is simple. Ladies need to cover their legs with pants or jeans, and men can wear whatever they want. If you don't dress appropriately, then expect stares from people who will look at you like you are from another galaxy. The basic idea is to blend in as much as possible. The crew of Exit Only in this picture wore their usual attire, and they had a pleasant shopping experience. 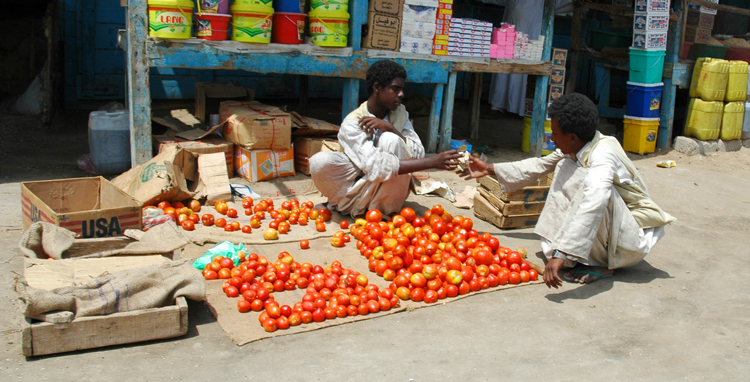 Sudanese vendors have tomatoes in abundance. These aren't hot house tomatoes. This is organic farming at it's best. These are awesome tomatoes, and they are cheap. The vendors even sold apples imported from Washington state. 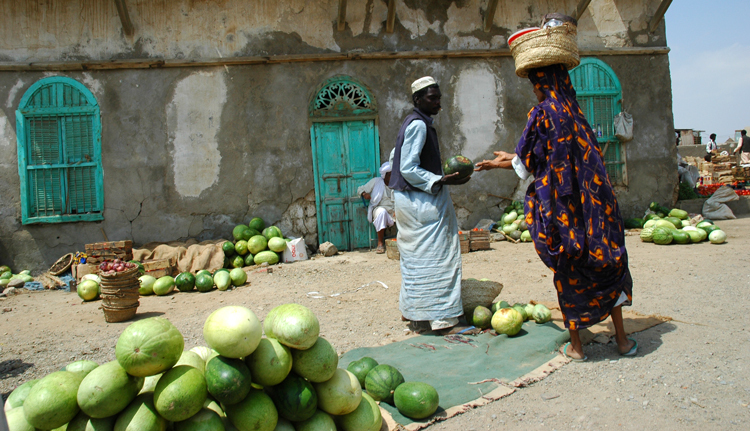 My biggest food surprise in Sudan was bazillions of tasty succulent watermelons. I would have thought it would be impossible to raise watermelons in the Sudanese desert. Wrong! When we took the bus to Port Sudan, there were fields of watermelons all along the highway. Donkeys are the most common beasts of burden in rural Sudan. 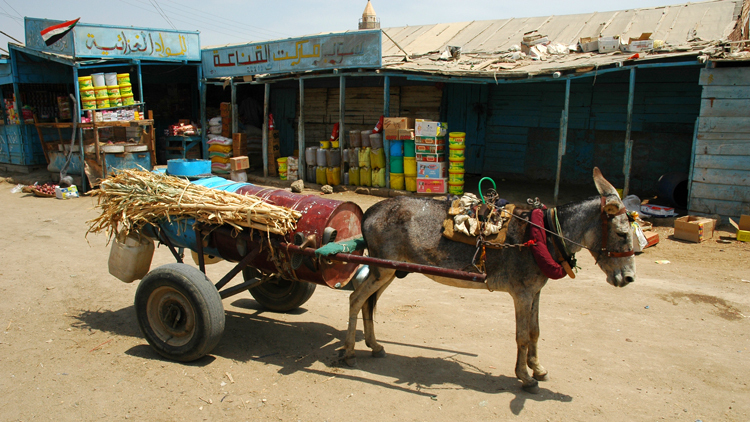 This donkey cart belongs to a water vendor who delivers water to the residents of Suakin and to yachties when they are in port. The foliage lashed to the water barrels is donkey fodder. These hard working animals earn their keep and their owners keep their investment alive and well by giving them an ample supply of food. Not everyone in the market place lives in Suakin. 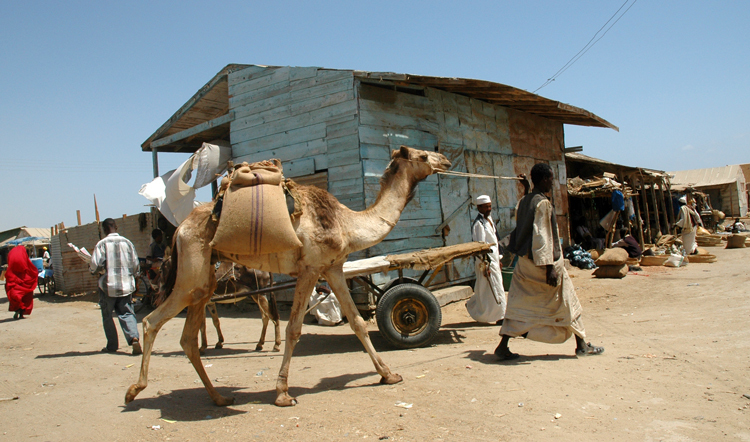 Bedouins come into town with their camels to pick up supplies. Donkey carts don't work well in the desert. 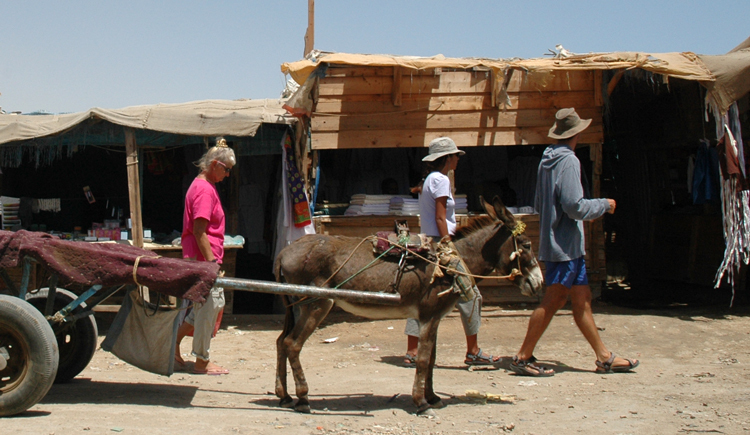 The donkeys aren't adapted to long desert treks, and the carts get stuck in soft desert sand. Hence, camels are the preferred beasts of burden for Bedouins who live in the desert. The Bedouin's clothes are stained tan by desert dust, whereas the residents of Suakin lack the tan color to their attire. This small business establishment sells sandals created by the man in the top left corner of the picture. 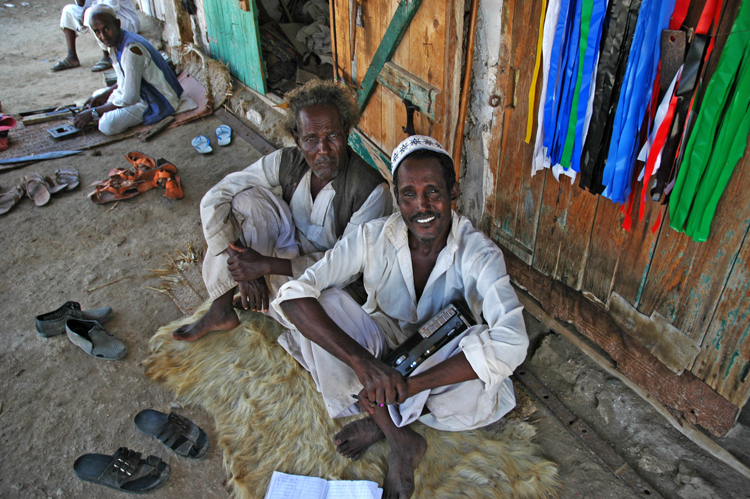 Every time I went into Suakin to shop, I would speak Arabic with these gentlemen, which always put a smile on their face. I don't know if they were impressed with my linguistic skills, but at least they were smiling most of the time. Smiling must be built into the Sudanese genome. Big smiles greeted us everywhere we went. This is "Telephone Man". With his four phones and world map, he can connect you with your friends and relatives anywhere on the planet. He keeps track of the time you spend talking, and he charges by the minute. 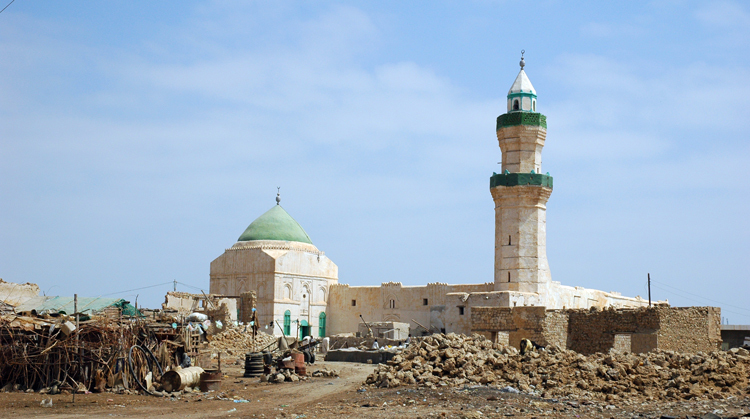 This is the main mosque in Suakin. Sudanese people come here to pray five times a day. Sudan does the best job of recycling that I have ever seen. If they have a 55 gallon drum that is empty, they cut it open and beat it flat to use as a wall in their houses. They recycle everything. If environmentalists give out an award to the greenest country on planet earth, Sudan would likely be the winner. Nothing goes to waste. 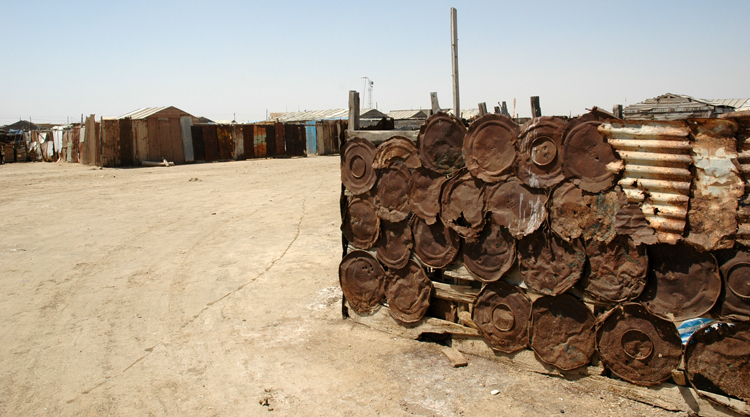 The walls of this enclosure are made of the tops and bottoms of 55 gallon drums. This house gives new meaning to the word recycling. Every scrap of wood is put to use in construction. Nothing is wasted. 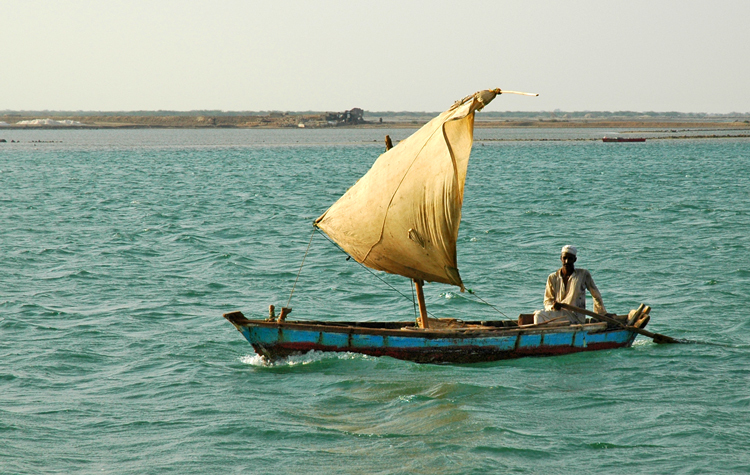 Sudanese fisherman make their own sails for their fishing boats. 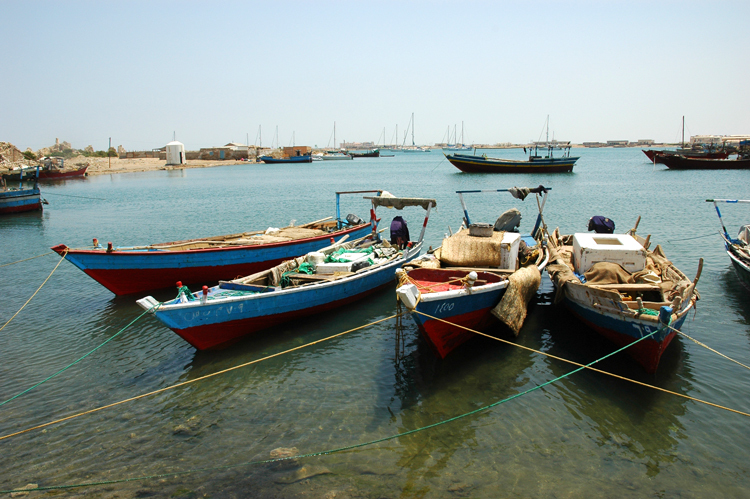 This boat glides silently across the harbor in Old Suakin. This single-handed fishing vessel uses a small sail to propel the yacht, and a small paddle serves as the rudder. If the wind gives out, the paddle becomes the source of propulsion of the boat. When shopping is done and chores on Exit Only are finished, it's time to do some windsurfing. After water tanks are topped off and food stores stowed on board, yachties leave Suakin harbor in single file hoping that there's a weather window waiting for them out there when they turn north up the Red Sea. Although Suakin isn't fancy, it's memorable, safe, and fun.